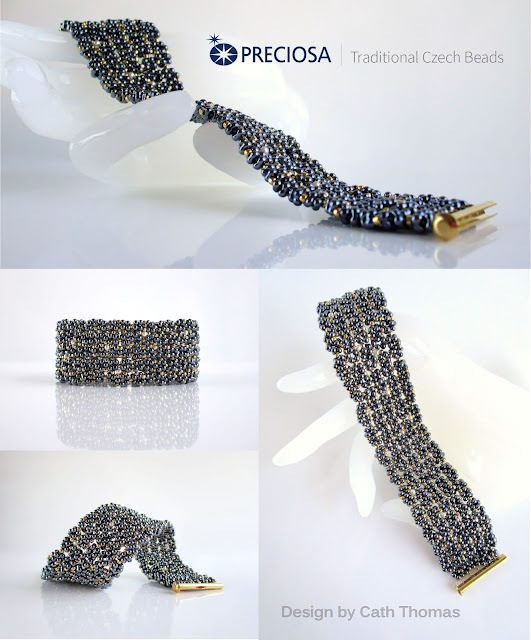 I received an envelop with a selection of Farfalle beads from Preciosa Ornella, to participate in a contest. 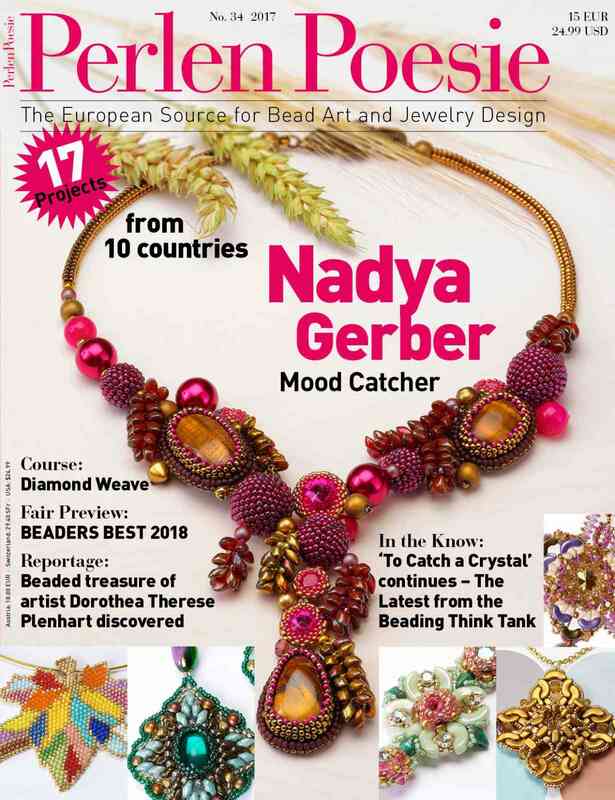 They offer to send samples of a particular shaped bead to beaders who, if they accept, have 14 days to come up with something to participate in the contest. That means that I had until the 7th of March. Generally I push my creative brain as far as possible for a contest, which takes a lot of feeling thinking and testing, in other words: a lot of time, so it's needless to say that 14 days sounded extremely short to come up with something new. But I liked the idea of a short deadline somehow. Deadlines have something energizing. I had a last bead to add to my Toho Challenge piece (which took 2 months to complete), photograph it and then could play with the Farfalle beads. My initial plan was to make something floral with one of the many Diamond Weave variations explained in my book, because the Farfalle beads behaved very well in the Mini Menat design. 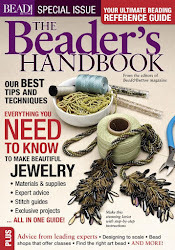 I think that they bring great depth and texture to beadwork. They can be a strong structural bead in DW, but my attempts at little daisies, with either hexagon and octagon stitch didn't work as I hoped. Adding little white pearls to hold the center of the units to prevent the farfalle from dancing didn't work well, because with their peanut-shape (or butterfly or bowtie shape, as their name suggests), they interlock naturally. 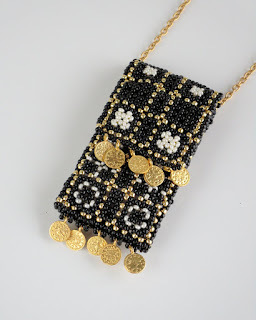 To stand tall, they should have no room at all in the center of the beaded units, otherwise they flip, which means only 4 beads per unit in DW and I didn't want to use them like that. 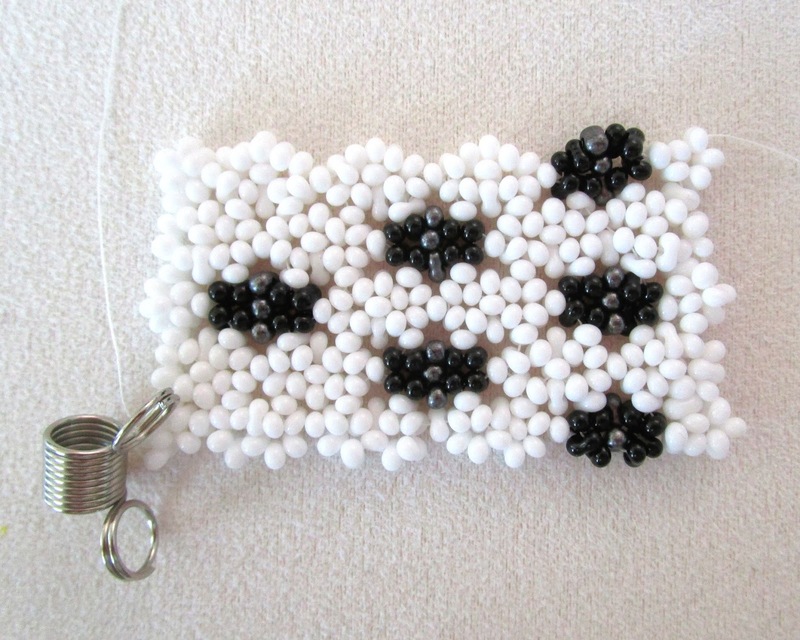 I could try to find another math or magic for the daisies, but the "texture"aspect of the beads took me on another path. I had been willing to create a pentagon stitch in DW since quite a while... pentagon stitch would, perhaps, offer a less symetric, but still structured design aspect. 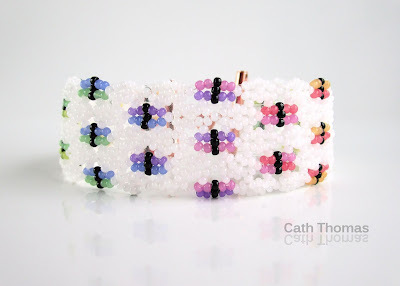 I looked at the 5-bead units as if one half was a basic unit and the other half a hexagon unit, and added single and double bridges (thread cover beads), and suddenly something amazing appeared: the beads formed a gazillion of little butterflies! Some farfalle beads still misbehave, but that's ok. The cuff has a wonderful, uneven texture, as if it had been "glass-smithed", yet a strong, regular woven structure. It has a nice weight and a pleasant, thick feel. With the 14kt gold-plated seed beads, the cuff looks like a starry night. 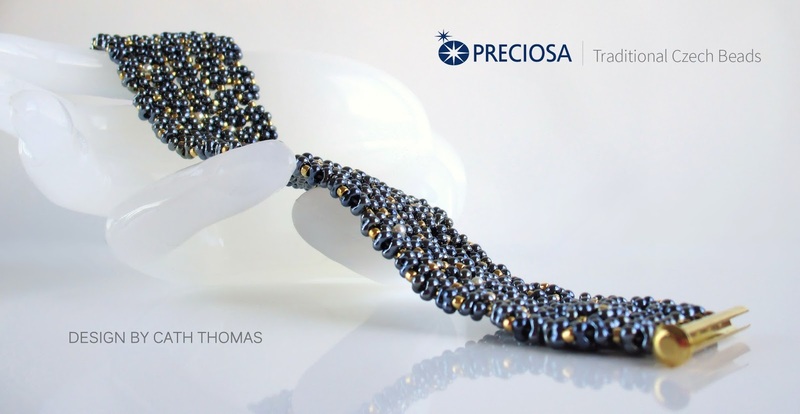 And because I love pearls, I added little 2mm white rounds to emphasize the starry night look without taking away interest from the woven structure. Now it looks a little bit like the Hydra constellation in a dark, starry sky, hence the name "Constellation" for this cuff. And because I love Italy, and butterflies and because farfalle is the Italian translation for butterfly as well as for bowtie (which can also be "seen" in the structure), I can only call this stitch Farfalle stitch. With Escher's drawings in mind, I started another cuff with black and white farfalle beads to better show the butterflies, but the texture of the beadwork looks like hail or snow - (I love it on its own) and the butterflies look more like little bats, and that, somehow, doesn't feel very compatible. 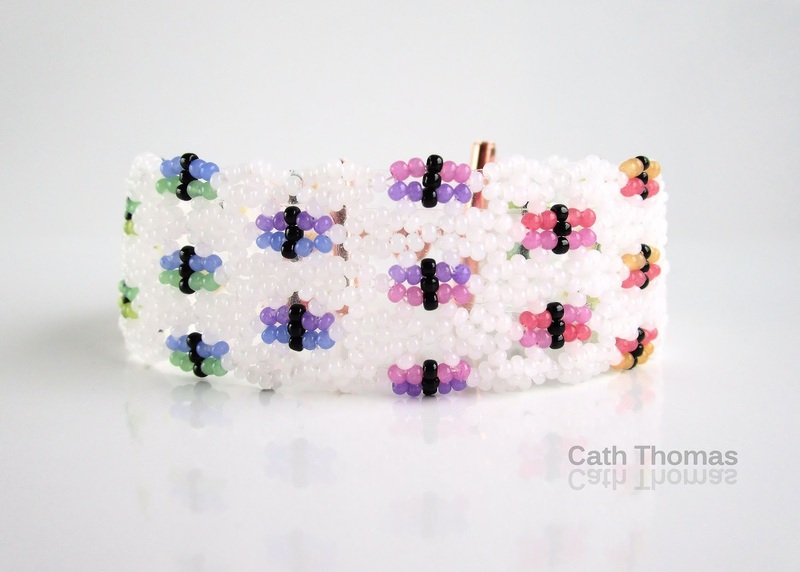 So to show the little butterflies, I decided to make another cuff with Preciosa's beautiful Solgel seed beads, in a rainbow of colors, and alabaster white. 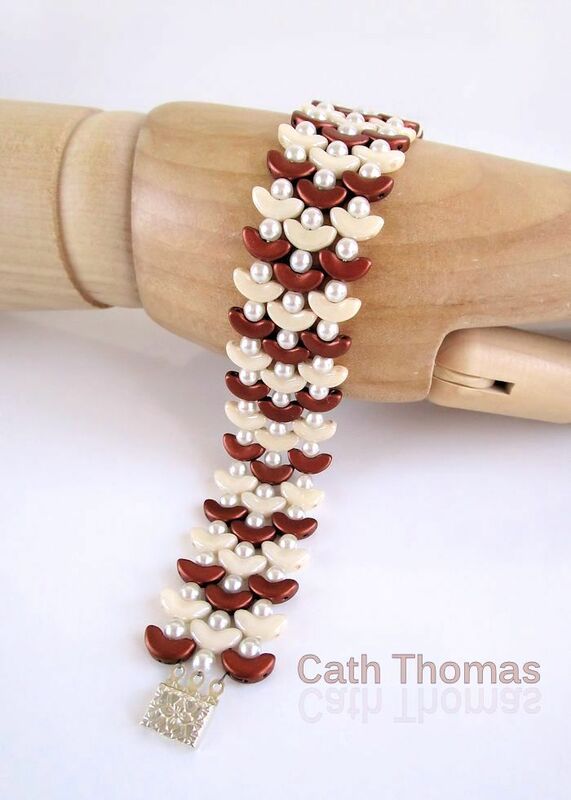 I love to see the two cuffs one beside the other, to show how two exactly the same pieces of work can have a different looks when different materials are used. I started writing a tutorial for the butterfly bracelet. A good design doesn't have to be complicated. We all have a different way of looking at things due to our different backgrounds. Our preferences, age, education, environment, life... all these things influence our designs. 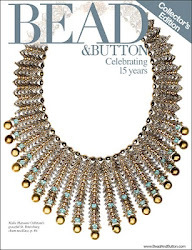 With beads and thread, designers re-invent a use nobody thought of before, which is truly fascinating. 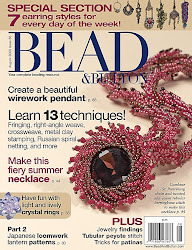 Of course, it can happen that shaped beads are used in a similar manner by beaders and result in design collision. Which is never funny, but as we say, great minds think alike. 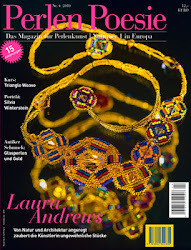 When I received the lovely Arkos beads by Puca to play with, they had already hit the market, in particular in Europe. So I looked a bit at what had already been done, and found many, many beautiful designs (there is so much talent out there, starting with Puca herself). But surprisingly not the simple one I had in mind. I might have missed it, so if you have made this design before, please let me know). What I was very excited about is that it gave me the opportunity to finally use the camelia buttons I fell in love with some time ago. They are enamelled and heavy, which is good in this case, because they remain under the wrist and show the beautiful gold beads always on top. The gold finish being fragile, this will prevent them from rubbing on tables and desks. 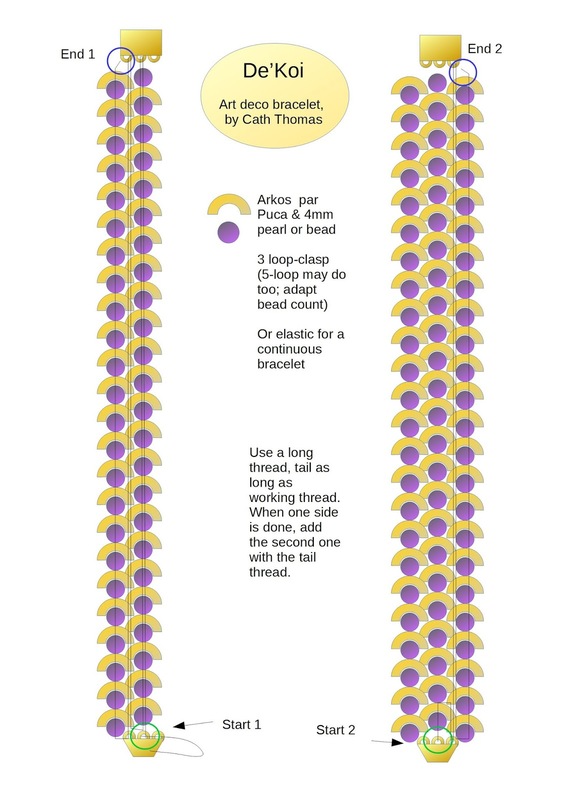 I also like the contrast brought by the white pearls, which are added using Diamond Weave in variation 2 and the instructions on how to make a buttonhole. 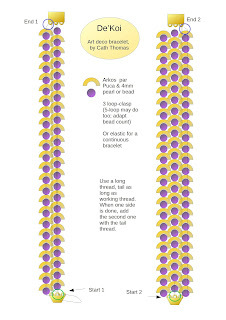 This is all explained in my book about Diamond Weave. 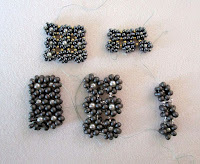 I really love the way the beads allow to create a scale pattern. I have this thing with gold fishes and dragon scales, you know, and I like a touch of deco and retro. It looks very beautiful on the wrist. And you know what? It is so simple to make that I made a little diagram for you to play with yourself. 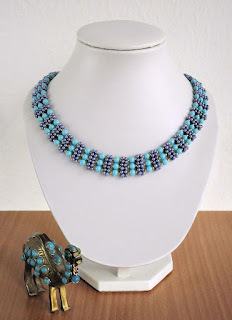 You will probably need to adapt the bead count and clasp attachment, which is a bit tricky, but I am sure that you will succeed. or buy my book. Your support is much appreciated. 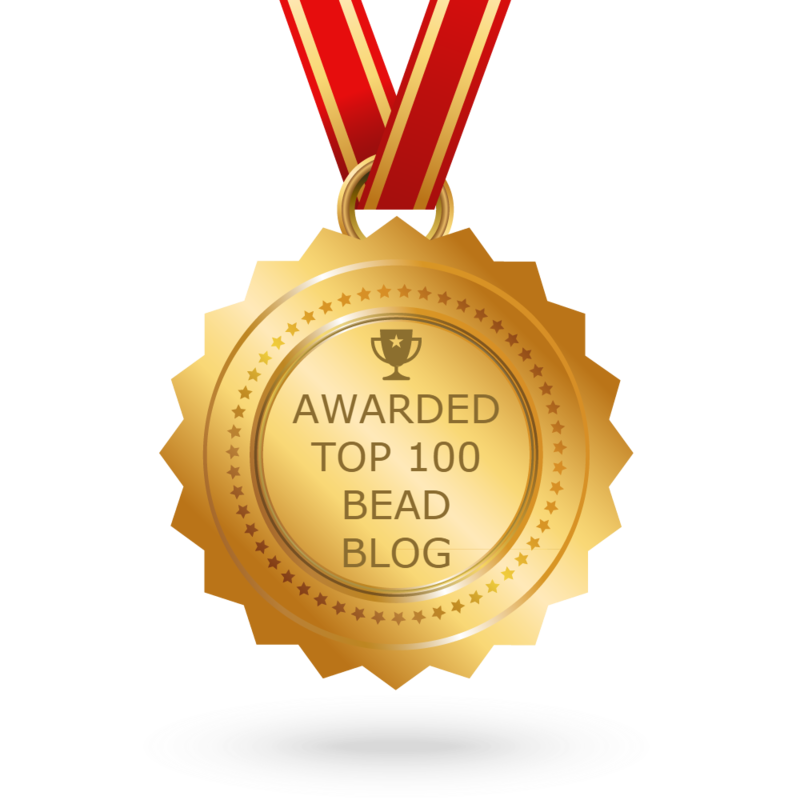 My epicondylitis issues - which lasted during several months (because it is so easy to put the fault on fibromyalgia, my doctor didn't worry much about it) - made me stop beading with beads and thread, but my brain continued. 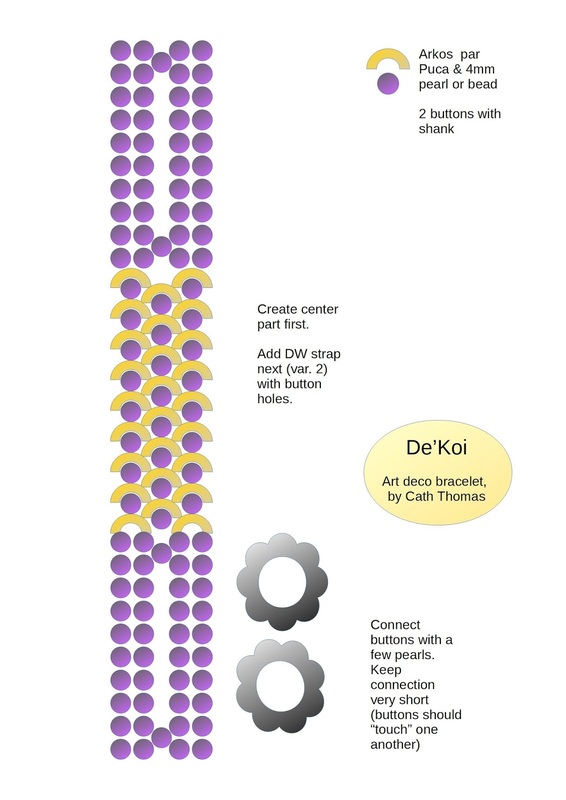 I made a lot of graphs of what came up in my beady brain during and after the writing of my book Diamond Weave. Each time I looked at the white graph paper, I 'saw' lines. Curves. Flowers. Fabric. Animals and insects. Because I needed to make space in my head for other things, I created these graphs for others to play with. 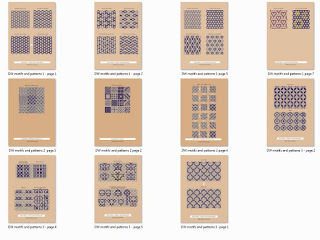 The result is a nice bundle of patterns. It took approx. 3 months to create them all. You can download them by clicking on the photo on the image on the right. 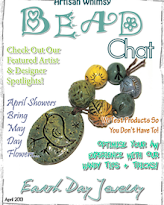 I haven't uploaded all the patterns yet, but this might already keep you busy, or inspire you. You can bead a sampler with plenty of different elements assembled the way you prefer - just like samplers made with cross-stitch. 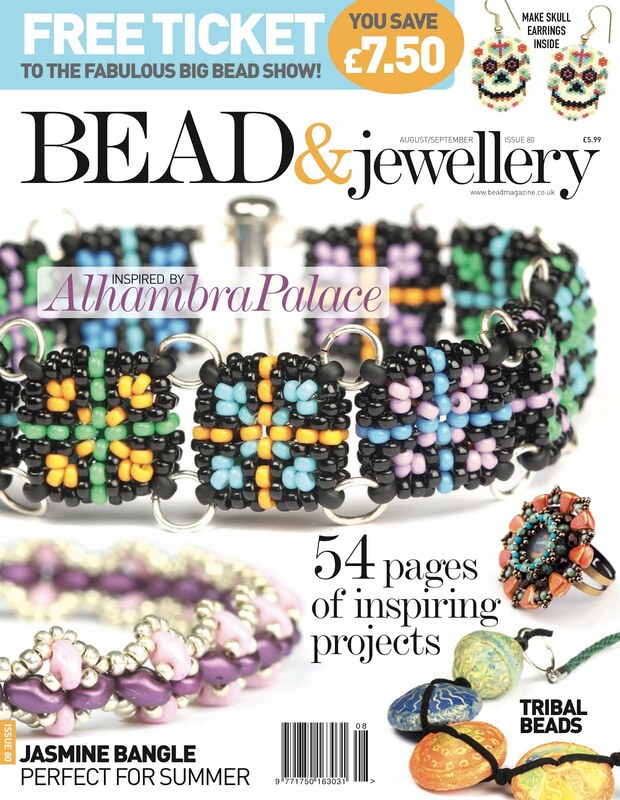 Both the book and these patterns are meant to boost your creativity! 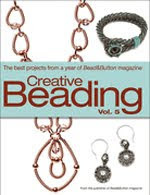 "Celestial Cuff" - Variation 3 with thread cover beads. 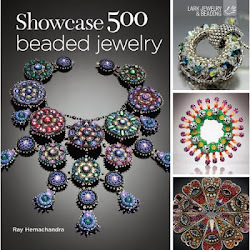 I would have loved to bead all the patterns and write tutorials for them, a little bit like my talented friend Carol Dean Sharpe, who has taken flat peyote stitch to a level of great art with her color choice and beautiful designs. 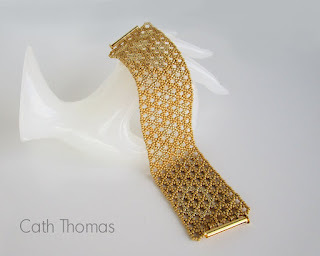 I created one bracelet, "Celestial Cuff" and one amulet bag, "Gate to Paradise" (inspired by the beautiful bronze doors of the Florence Baptistery created by Lorenzo Ghiberti) using some elements shown in these patterns. 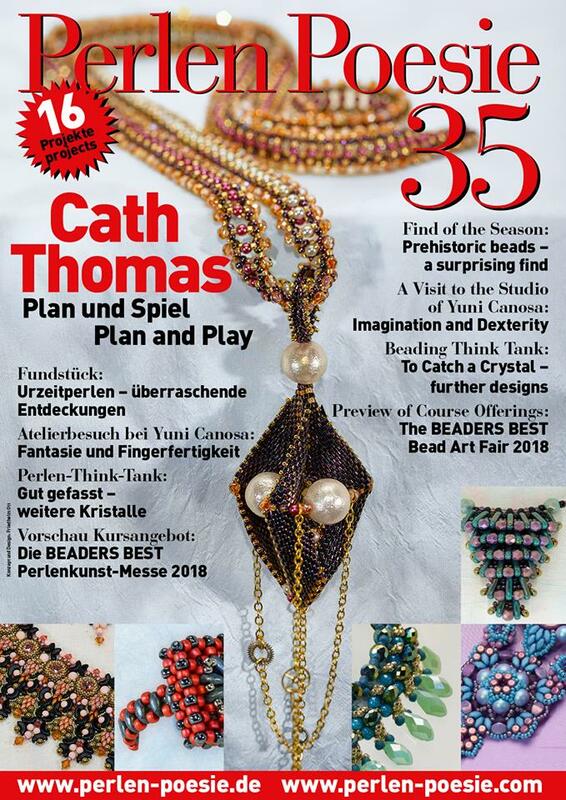 I also started a third piece, with beautiful antique beads I received from the talented German designer Kris Empting-Obenland, whose work is a delight for the eyes. Alas, my fibro got in the way, and my elbows got worse. It was quite frustrating not being very productive in 2016. Very little beadwork, nearly no patterns... Also, it appeared that working on the computer was actually worse than beading and I should have stopped drawing, writing and browsing. Fortunately, something strange happened: I had to take antibiotics (for other reasons), which appeared to help the tendons a real lot! The doctor still has no answer for that, but am very happy to feel better. 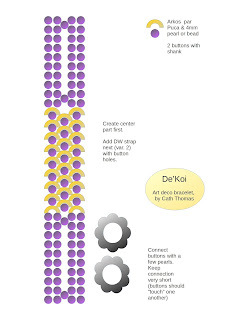 I will soon add more patterns to the Diamond Weave Facebook album There are still lots of graphs for you to discover in addition to what is there. I'm sure that you will find something that you like, and welcome photos of your beautiful work! I stood away from the computer as much as possible and finished the Toho Challenge, which was great fun, but challening! I love challenges like this. It was very stimulating. Unfortunately, I am not allowed to show anything now. 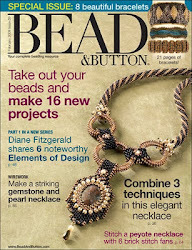 The great reveal will take place in Milwaukee during the Bead and Button Show. 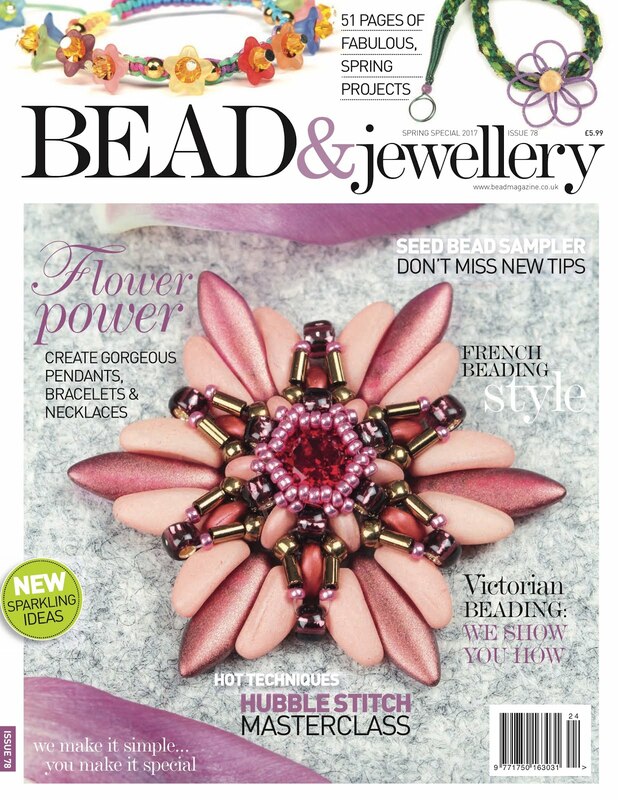 I can't wait to see other beaders' creations. 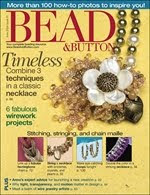 Note that it will be the first time that one of my creations will be shown at Bead & Button Show, which thrills me. 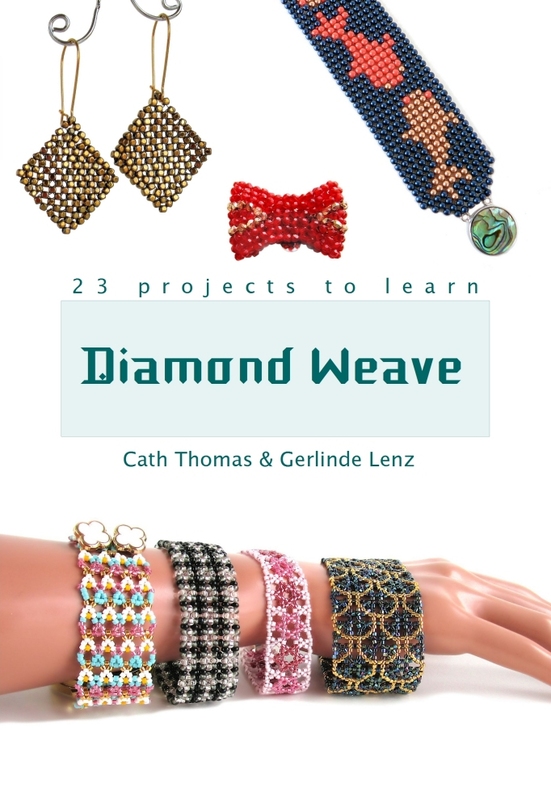 And if you don't have the book Diamond Weave yet, I hope that you will buy it. It is a great book. You don't need to believe me: just read the reviews posted on Amazon! 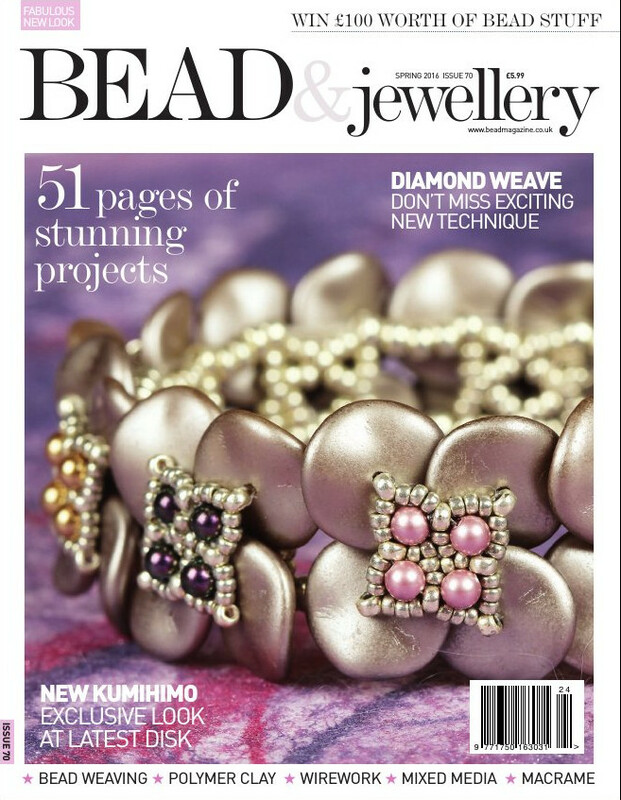 Thank you for reading me and Happy Beading!